Have you ever heard about the Amish in Mexico? It’s quite a remarkable story. No, there are no Mexican Amish communities (at least not anymore). But thanks to their outreach to a group of spiritual kin, the Amish have had a regular presence in Mexico for the last two decades. Old Colony Mennonites are an Anabaptist group with some cultural similarities to Amish, including Plain clothing and a German dialect. They live predominantly in Mexico and other Latin American nations. Old Colony Mennonites originally came to Canada from Ukraine in the 1870s, but in the 1920s migrated to Mexico due to public schooling requirements. They are close spiritual cousins to Amish and Mennonites, but unlike most of their religious kin in North America, they have suffered due to a weak educational system, exacerbated by their relative isolation and fear of outside influences. Specifically they have faced serious problems with literacy and mathematics. Many have failed to recognize the importance of education, with some parents even neglecting to send their children to school on a regular basis. The colonies in turn have had a lack of qualified teachers since their schools have been producing such poorly-educated people. It causes concern for the church as to how our schools will eventually end up. It seems as though we are approaching a time when our own colonies can no longer provide their own teachers. Which is not surprising, for no one feels equipped for the job. Of a truth, such weak schools do have a hard time producing real teachers. The low overall level of education has had negative effects not only on their economic prospects, but also on the spiritual life of their communities, due to not being able to read and comprehend the Bible. As Peters notes, “How can they search the Scriptures who can neither read nor understand them? They can hardly understand even when the Word is read aloud to them” (p. 91). Facilitated by Mennonite Central Committee, Amish learned of this situation in the mid-1990s. Thanks to the efforts of some motivated individuals, they began helping by sending Amish teachers south to teach Old Colony children. Though they were not welcomed by all, the program has grown and seen successes in the ensuing years. Amish from at least a half-dozen states have participated as teachers, or in supportive roles as house parents or house sisters. This might be the best example of an international mission program you’ll find among the Amish (who tend not to do a lot of international mission work, at least not work that involves international travel, though there are exceptions). 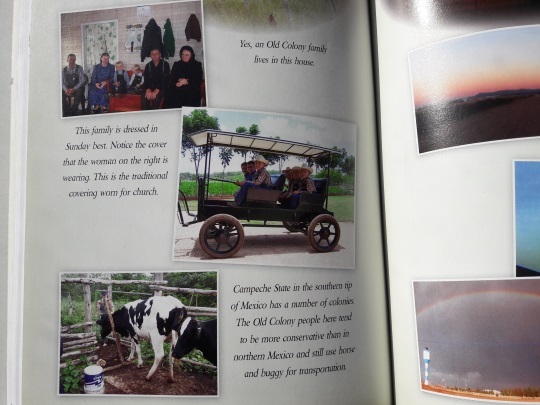 Rebecca Miller, member of an Amish church in Ohio, wrote about the background of the Old Colony people and this remarkable project in a 2016 post (Rebecca later went to Mexico herself to teach). You can also find it documented in other writing produced by the Amish, including the book Called to Mexico referenced above. The two things that jumped out at me here are the number of participants – over 200 teachers in the program’s roughly 19 years – and the fact that students have begun teaching using Amish teaching practices. This will help assure the long-term success of this program. The Amish were a good fit for this role, in large part because they were a good example – a “people apart” who had built a successful parochial education structure, which allowed their children to become both good church members, and productive members of society. Amish have historical and cultural similarities, and respect for Old Colony Mennonite belief, but clearly there must be a level of trust there that these are not “conversion” missions, but rather done in a spirit of brotherly love. No doubt it had to take some courage on the part of the Mennonites to open up to outside help. I am really interested in this issue being an ex certified language arts teacher. By ex I mean I did not get my certificate renewed because I did not have another teaching position. If you could send me information on the issue and anything pertinate to it. Dawn if you’re interested I think the Called to Mexico book I mentioned could be a really good resource to give you a picture of what the colonies are/were like and the experience of the teachers and others involved. Dawn — Erik’s suggestion of contacting Raber’s Bookstore is good, because they might have the book. Another possibility would be Gospel Book Store in Berlin, Ohio which advertises in The Budget newspaper every week. Their advertisement always includes the note: “Looking for any specific book? Gospel Book Store stocks many Amish and Mennonite books. Erik — Thanks for including this post. I regularly read in The Budget in letters from Amish communities in various states reports from schoolteachers from their communities who are currently in Mexico teaching. It was interesting to learn more about this in your post on the subject. I subscribe to Die Botschaft and often read the letters sent in by the young Amish women who come from Lancaster County, PA and teach in Mexico. It is so very interesting to read of their trials and successes with the children there, and their travels in the area in their leisure time, as well as their interaction with the Mexican families. They seem to be very well received, and certainly have an exciting adventure to remember when they finally come back to the U.S. God bless their work and those who support this mission. Eric, just curious what language do they speak? Do they speak the Pennsylvania Dutch? Jason the German dialect they speak is not Pennsylvania Dutch but Plautsdietsch which is a Low German dialect. I was asking someone about this in PA in December and it sounds like the teachers at least in that case use High German to teach the students. However the Called to Mexico book also lists around 15 English teachers who have spent time in the colonies from 2009-2011 (book was published in 2011), so there’s been some English instruction going on as well. May the Lord bless them all! Reading this nearly brought me to tears. I’m sure many readers would like to help and would appreciate more information.